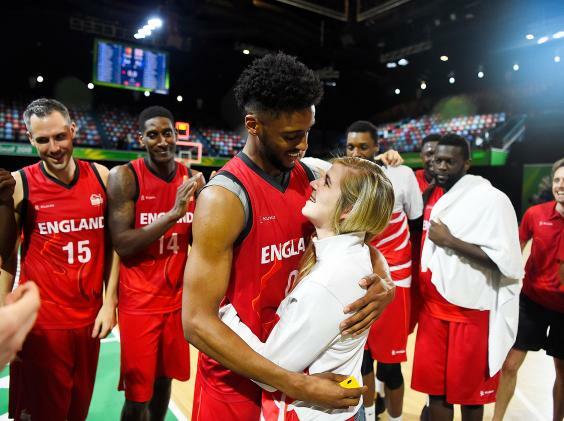 Jamell Anderson got the ultimate assist from his team-mates as he popped the question to fellow England basketball player Georgia Jones at the Commonwealth Games on Sunday. Anderson surprised his now fiancee moments after England’s 81-54 victory over Cameroon, a win that was enough to put the men’s team into Round 2 of the competition in Townsville. Video released by Team England showed the men’s team gathered in a post-game huddle while Jones watched on – having earlier contributed nine points to a 78-51 win over Mozambique for the women’s team. Jones thought she was there to take a celebratory photograph, but as the huddle broke Anderson was waiting down on one knee. “I only told them just now,” the 27-year-old Anderson said of getting his team-mates – who include Georgia’s brother Callum – involved. “They initiated the plan really well, so that went perfectly. Anderson plays his club basketball for FG La Roda in Spain while Jones, 28, plays for Manchester Mystics in the Women’s British Basketball League. Anderson had everything planned out in advance, getting the blessing of Georgia’s father Jeff, a former England international and her head coach with the Mystics, before his on-court proposal. 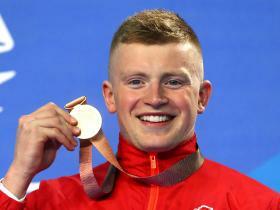 He chose the Commonwealth Games as the ideal venue for a proposal as both players get to represent their country on the world stage at the same event.